Oxford Carriers is proud to be part of TPN – THE Pallet Network. TPN is the UK’s leading pallet network, with more than 120 sites throughout the UK, the very best postcode coverage and the best IT systems. It offers excellent service levels for next-day, timed or economy deliveries for any palletised goods. TPN has three UK Hubs and excellent operational protocols, enabling it to sustain the high service levels we expect for our clients through peak-volume periods. This means that even when you are at your busiest, or the market as a whole prepares for peak volumes, such as in the run up to Christmas, we can have absolute confidence in the service we offer you. 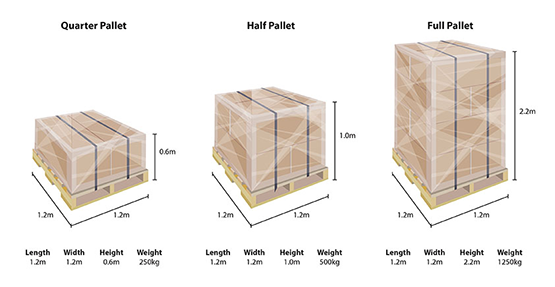 Through TPN, we handle full, half or quarter pallet sizes, and you can see the dimensions on the images below. We can also take oversized freight which requires more than one pallet space. For freight which measures 2.6m or more in length or width, ask about our expert service TPN XL. This gives guaranteed delivery windows and the specialist handling required by your larger palletised freight. TPN has market- leading and award-winning IT technology, all of which is available to our customers. Customers can log directly into TPN Connect for job entry, full live track and trace via PC or mobile device and automatic POD notifications via email. You can download TPN’s customer brochure here.